The right size mixing system is key for drilling operations, and the new MX300 mixing system can help you achieve maximum productivity. 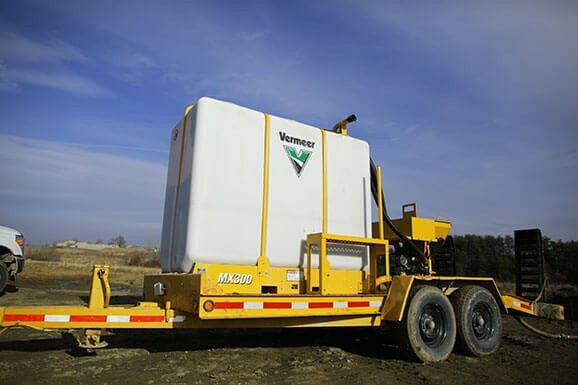 With the option to arrange your setup to meet the jobsite needs, this mix system can be configured through mounting the tank in a variety of positions related to the power unit. A single or dual tank can be paired with just one power unit, allowing for the option of more drilling fluid onsite. The narrow rectangular tank design can help maximize fluid volume and can be mounted for convenient transport and storage. Serviceability is efficient, with convenient access to the roll jets through the top of the tank. Drain your MX300 with two drainage points, activated with the opening of two easily accessible valves. With a suction hose and a wide-mouth hopper, inject your drilling additives into the system to create your right mix. The 350 gpm (1324.9 Lpm) pump flow efficiently mixes high volumes of fluid for a variety of bores - from smaller shots to large-diameter and longer-distance HDD applications in varying soil types. The MX300 mixing system pairs well with a variety of drills and is made to mix!